Comfort should be a necessity, not a luxury. 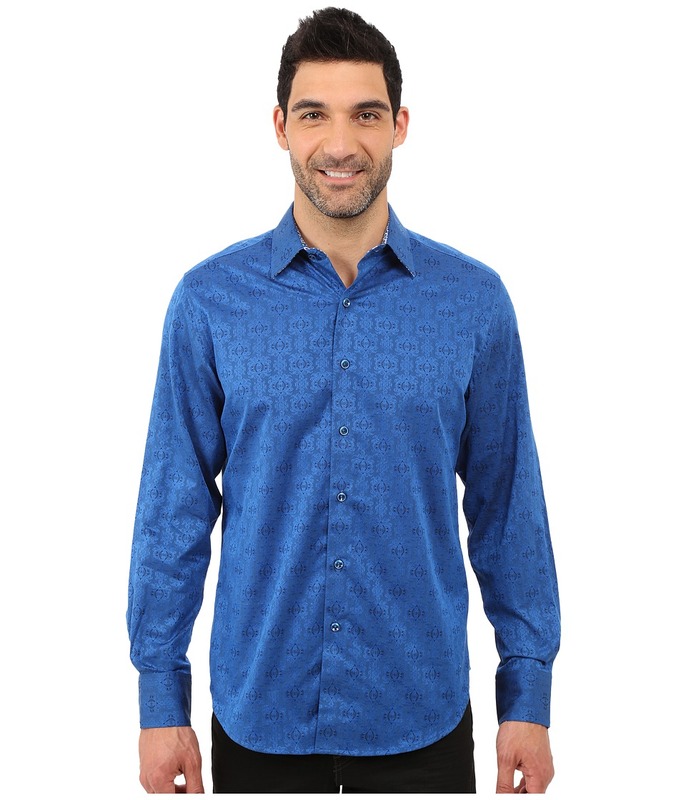 Step up your wardrobe with a signature Robert Graham Traveler T-Shirt. Timeless classic fit continues the heritage of traditional ease and comfort. Crafted from a sublimely soft modal-blend knit, makes this a must-have for layering or to wear on its own. Shallow V-neckline with ribbing. Short-sleeve design. Contrast stitching details along the seams. Knowledge Wisdom Truth embroidery at interior hem. Straight hem with split side seams. 60 percent cotton, 40 percent modal. Machine wash, tumble dry. Imported. Measurements: Length: 30 in Product measurements were taken using size MD. Please note that measurements may vary by size. Enjoy a gentleman~s night out in sophisticated style with the impeccable Cullen Sport Shirt. Timeless classic fit continues the heritage of traditional ease and comfort. Finely woven cotton shirt in an ornate jacquard design. Spread collar. Full button-front closure. Straight back yoke. 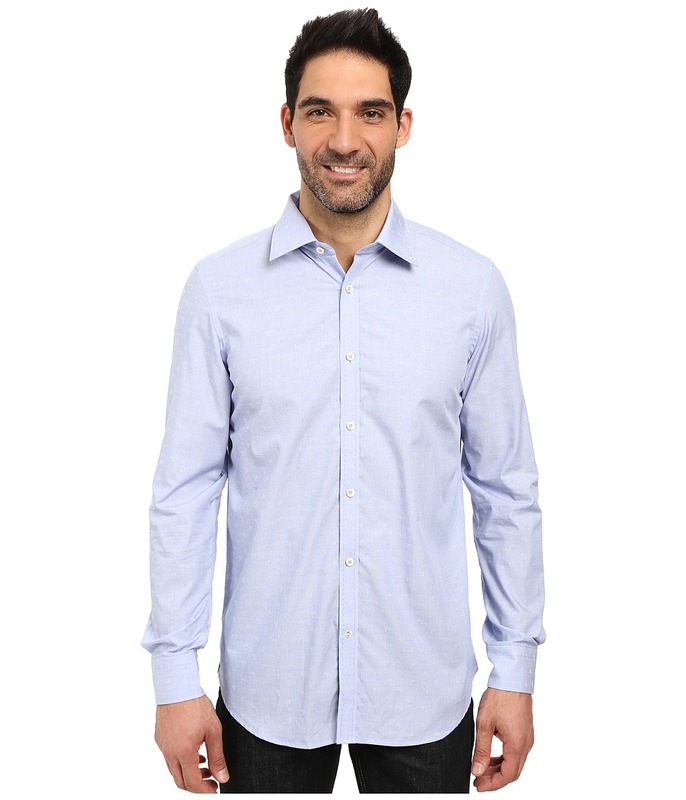 Long sleeves feature notched, double-button barrel cuffs. Contrast lining at collar and cuffs. Knowledge Wisdom Truth embroidery at placket bottom. Shirttail hem. 100 percent cotton. Machine wash, line dry. Imported. Measurements: Length: 31 in Chest Measurement: 48 in Sleeve Length: 35 1 2 in Product measurements were taken using size MD. Please note that measurements may vary by size. 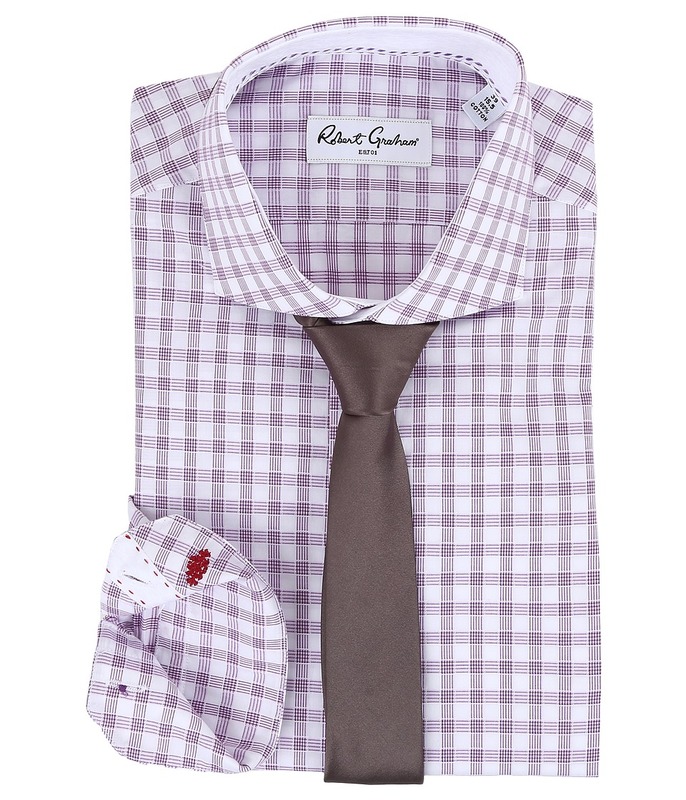 Keep your style as sharp as your focus with an always collected Robert Graham dress shirt. Please note, pictured tie is not included. Timeless classic fit continues the heritage of traditional ease and comfort. Comfortable cotton fabric sports a slightly textured design. Contrast taping trims the cuffs and neck tape. Knowledge Wisdom Truth embroidery at placket bottom. Long sleeve, button-up dress shirt. Spread collar with collar stays. Single-button, mitered cuffs. Shirttail hemline. Straight back yoke. 100 percent cotton. Machine wash warm, hang dry. Imported. Measurements: Length: 32 in Chest Measurement: 44 in Sleeve Length: 36 in Product measurements were taken using size 15.5 (MD). Please note that measurements may vary by size. Keep your style as sharp as your focus with an always collected Robert Graham dress shirt. Please note, pictured tie is not included. Timeless classic fit continues the heritage of traditional ease and comfort. 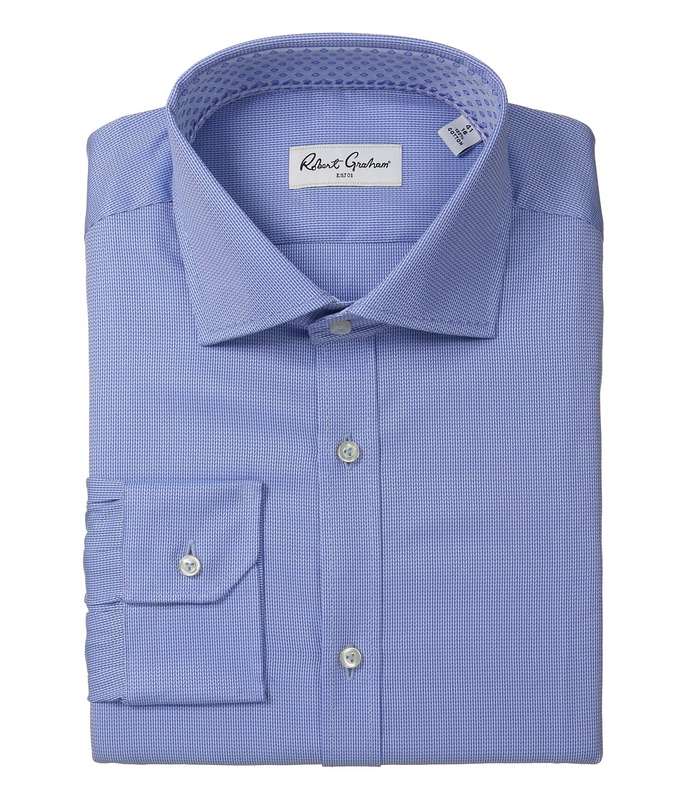 Comfortable cotton fabric sports a slightly textured herringbone design. Contrast taping trims the cuffs and neck tape. Knowledge Wisdom Truth embroidery at placket bottom. Long sleeve, button-up dress shirt. Spread collar with collar stays. Single-button, mitered cuffs. Shirttail hemline. Straight back yoke. 100 percent cotton. Machine wash warm, hang dry. Imported. Measurements: Length: 32 in Chest Measurement: 44 in Sleeve Length: 36 in Product measurements were taken using size 15.5 (MD). Please note that measurements may vary by size. Let your style reign supreme with a detailed Robert Graham Messenger Polo. Timeless classic fit continues the heritage of traditional ease and comfort. 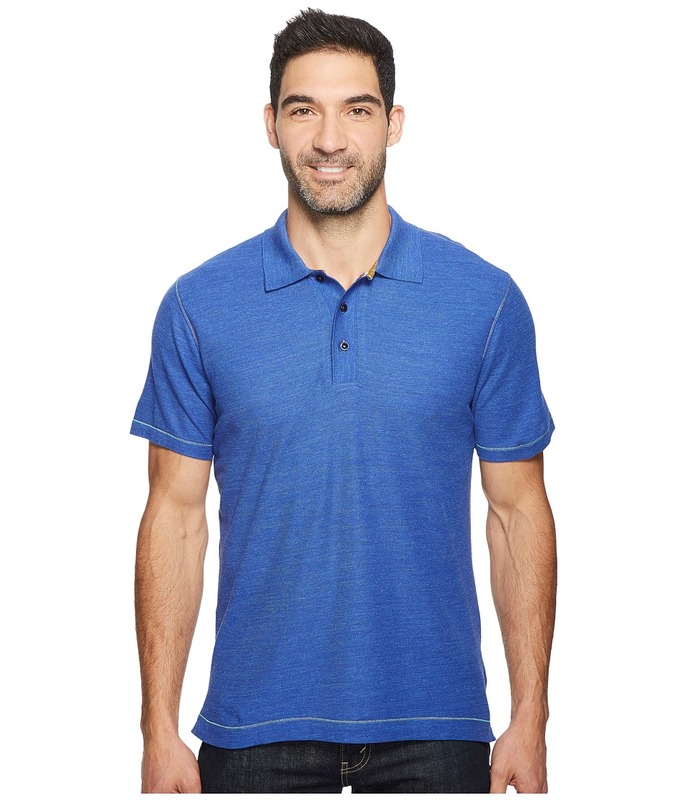 Luxuriously soft pique polo is crafted from a lightweight modal-blend knit for a superior-hand feel. Signature splash print details under collar, placket and side vents. Ribbed fold-over collar. Short sleeve design. Ribbed three-button placket. 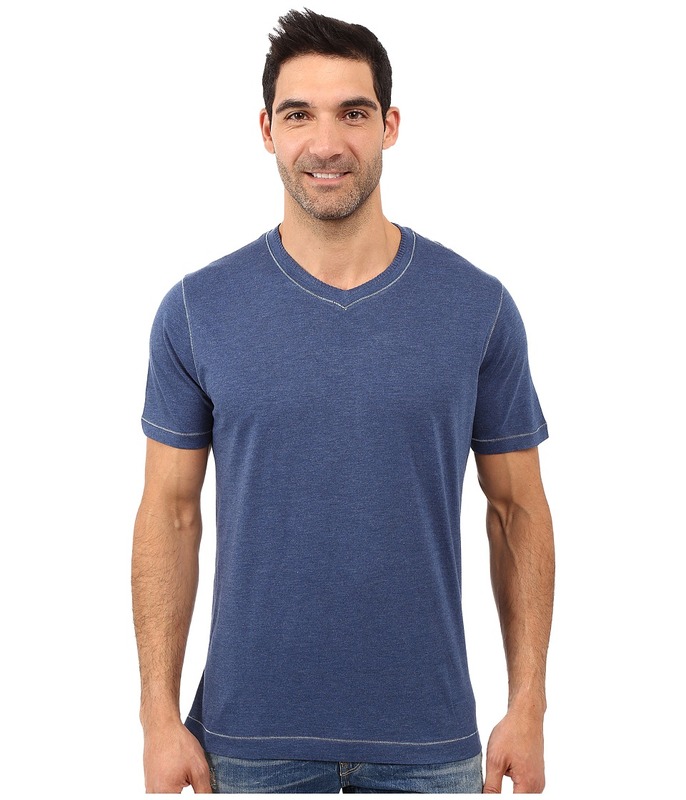 Contrast flatlock seams throughout lends a comfortable wear. Knowledge Wisdom Truth embroidery at interior hem. Straight hemline with side vents. 60 percent cotton, 40 percent modal. Machine wash, tumble dry. Imported. Measurements: Length: 30 in Product measurements were taken using size MD. Please note that measurements may vary by size. 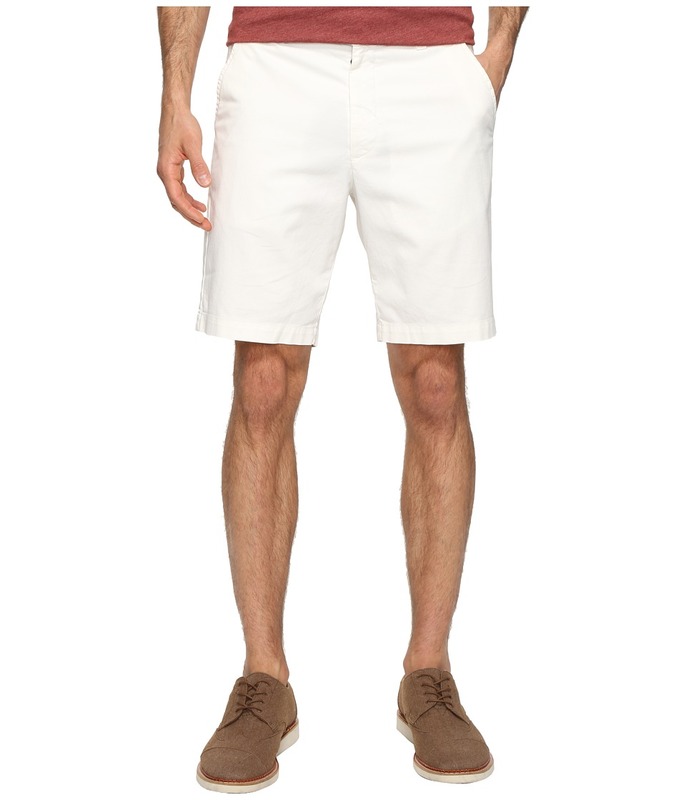 The weekend at the Hamptons isn~t complete without a Robert Graham Pioneer Shorts. Lightweight short is crafted from a smooth, luxuriously soft woven. Belt loop waist. Four pocket design with a button-through tab at back. Button front and a zip fly closure. 97 percent pima cotton, 3 percent Lycra. Machine wash, tumble dry. Made in Peru. Measurements: Waist Measurement: 32 in Outseam: 19 in Inseam: 9 in Front Rise: 11 in Back Rise: 17 in Leg Opening: 19 in Product measurements were taken using size 32, inseam 9. Please note that measurements may vary by size. 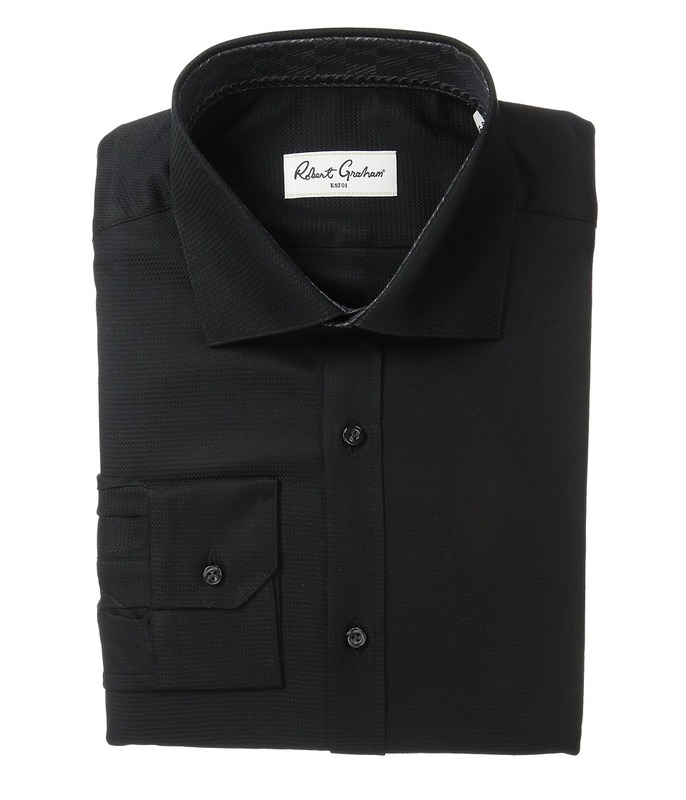 Keep your style as sharp as your focus with an always collected Robert Graham dress shirt. Please note, pictured tie is not included. Regular Fit. Shirt boasts a timeless plaid pattern. Contrast taping trims the cuffs and neck tape. Contrast embroidery accents the interior placket and turn-back cuffs. Knowledge Wisdom Truth embroidery at placket bottom. Long sleeve, button-up dress shirt. Spread collar with collar stays. Single-button, mitered cuffs. Shirttail hemline. Straight back yoke. 100 percent cotton. Machine wash, hang dry. Imported. Measurements: Length: 32 in Chest Measurement: 44 in Sleeve Length: 36 in Product measurements were taken using size 15.5 (MD). Please note that measurements may vary by size. Keep your style as sharp as your focus with an always collected Robert Graham dress shirt. Regular Fit. Comfortable cotton woven sports a barely-there paisley print. Spread collar with collar stays. Long sleeve, button-up dress shirt. Single-button, mitered cuffs. Knowledge Wisdom Truth embroidery at placket bottom. Contrast taping trims the cuffs and neck tape. Straight back yoke. Shirttail hemline. 100 percent cotton. Machine wash, hang dry. Imported. Measurements: Length: 32 in Chest Measurement: 44 in Product measurements were taken using size 15.5 (MD). Please note that measurements may vary by size. Keep your style as sharp as your focus with an always collected Robert Graham dress shirt. Timeless classic fit continues the heritage of traditional ease and comfort. 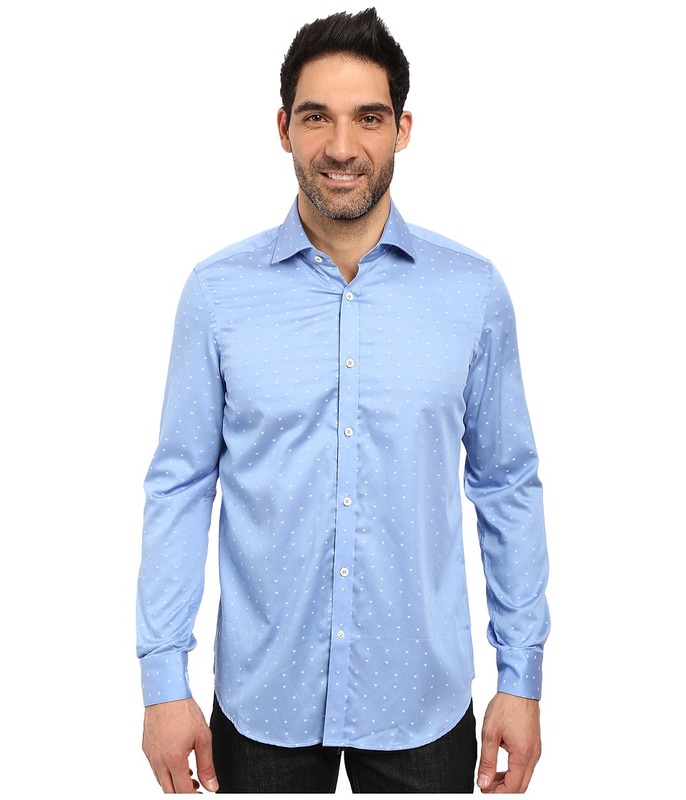 Finely woven shirt in a jacquard dot design. Spread collar with collar stays. Long sleeve, button-up dress shirt. Single-button, mitered cuffs. Knowledge Wisdom Truth embroidery at placket bottom. Contrast taping trims the cuffs and neck tape. Straight back yoke. Shirttail hemline. 100 percent cotton. Machine wash, hang dry. Imported. Measurements: Length: 32 in Chest Measurement: 44 in Product measurements were taken using size 15.5 (MD). Please note that measurements may vary by size.